Ah, simpler times. You can bet nowadays the publisher would give serious thought to redesigning this cover. Obviously I had no real friends when we first moved to Cochabamba. This predicament lingered for a while, so I spent a lot of time in the school library like a nerd loser. 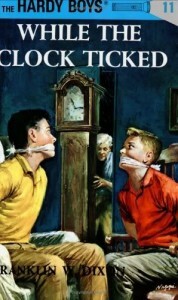 In the first month, I’d read every single Hardy Boys novel they had, sometimes churning through 2 a day. That’s how desperate the situation was: 24hr Hardy Boys. While the Clock Ticked was the first one I ever read, back in Australia. Finding 3 shelves full of Hardy Boys in the library now was like heaven. And you knew it would never end because they’re still churning them out every year and by now Mr so-called ‘Franklin W. Dixon‘ must be about 180. But everything was OK back then ’cause all I cared about was reading the Hardy Boys. Frank & Joe Hardy: With their unimaginative 1950’s caucasian names, running around exerting clichés on people with their well-sculpted arms and tight fists. Doing all kinds of implausible things in all kinds of implausible situations. They were the best role models ever. In those early days, I never understood why the other kids didn’t want to be around me. After all, I had this fantastic aussie cap with a piece of fabric sewn on the back to stop the sun on your neck. Did I mention it was bright yellow and had pink lettering? I can’t remember what it said. Something inviting beatings. Australia went through this anti-sun phase for a while there. Looking like a dork was better than getting skin cancer I guess. Or a tan. Or friends. To complete the effect, I wore shorts and a shirt that were way too small, and a pair of boots belonging to my mother along with bright yellow fuzzy socks. At least I wasn’t going missing anytime soon. Later, after continued pleas about fitting in and perhaps, maybe one day, procreating, Mum was kind enough to let me buy some Reeboks in the market. I soon discovered they were fake and made of cheap plastic, having the athletic support of a couple of bags of crushed Cheetos. I remember Cory being polite about it and saying they looked real, from a distance. That was nice. Didn’t help my crushing back pain or crippled self-esteem. I also didn’t fit in because I had a weird accent none of them could understand. I had Bolivian, American & Kiwi kids to contend with at school. The odd Swede (his older brother was fine) and a Norwegian or two and some Koreans. Probably some more nationalities thrown in for good luck. One Bolivian guy in my class asked me, in all seriousness, how I learned english so quick since I was from Australia and had only been there a week. I wanted to cliché him in the face. I did get some mileage out of an “Australian” dialect I made up. One good thing about our school was that we lived right next door to my classroom. I could pretty much roll out of bed at 8:55 and be fine. Everyone else would think my tussled hair and lack of personal hygiene were just obscure cultural phenomenon. Speaking of hair, anytime it was out of place too much, Dad would lick his palm and use it to flatten it all back down. Just so I’d get a second chance at popularity. And smell vaguely of spit. Me & Dad: Hip & Cool. Of course, I could have gotten up everyday at 8:55, except after a little while I got to know Seth from Rhode Island, who also lived on the grounds, and who loved getting to the playground before everyone else arrived on the buses. Seriously, that kid would rock up at 7:30 in the fog on Christmas day naked if it meant some free time on the swing. Those were great days, aside from the awkward nakedness. For at least an hour or 2 before anyone else showed up we owned the joint. And the school had this amazing playground. A flying fox, some giant spinning thing the Americans called a Maypole that could launch you into outer space if Andy was swinging you, and tether ball; all things I’d never seen before. I was now realising just how close to heaven I really was. Seth also had a Pekingese dog that we’d play with, which looked like a cross between an Ewok and a foot rest. I don’t remember much else about Seth except one night we were playing in the freshly-dug foundations of some new classrooms throwing dirt clods at each other in the darkness. (I know, just horrific parenting to let us play out there, might as well have given us packs of Cigarettes and copies of Female Trucker Monthly.) One of mine hit Seth in the face and that was that. I think I was kind of a brat about it too and it took some time to squeeze an apology out of me. Like a month or three. Mainly due to the hideous scaring. It was like having the elephant man living next door. Seth, if you’re reading this, sorry I bashed you in the face with dirt and who-knows-what. We did make up eventually. I even let him sleep over in my closet once. We were always finding somewhere bizarre to sleep. Sleeping in your own bed was boring and for idiots who wanted actual rest. Once we slept on his lawn sans tent of any kind with only a lit bed lamp burning to keep the dew off. Great idea. Prison Inmates got better sleeping conditions. And less electric burns. And probably actual sleep. One time we spent all day on the swings because it had rained overnight and there were huge puddles underneath where hundreds of kids’ shoes had worn the ground away. We got so filthy dirty we figured a bath was appropriate and got to displacing all the dirt from our skin onto Mum’s bathroom floor. Mum wasn’t a big fan. I thought personal cleanliness was her deal. Nope. From memory, I think she had some pretty large clichés coming for me once Seth went home. Posted in Adventure, Bolivia, SchoolTagged carachipampa, cochabamba, Hardy Boys, Missionary Kid, MKsBookmark the permalink. Ardin, who knew you were such a good writer? I totally remember the maypole thing and it could launch us into outer space. LOVED it. I laughed out loud more than once tonight reading this. I remember Seth too. He used draw crazy machines in his cuadernos and tell me all about the things that he was going to invent. Good stuff though Ard, when is the book coming out? ?